Dr. Barbara Mix stops by a stable near Horseheads, New York, to check on an injured show horse. Working as a veterinarian for several decades, Dr. Barbara Mix, DVM ’82, has treated species large and small, familiar and exotic, from alpacas to zebras. In recognition of the cumulative and consistent impact of her veterinary and volunteer work in and around her hometown of Horseheads, New York, Mix was named the latest recipient of the Cornell New York State Hometown Alumni Award. Dr. Barbara Mix receives the Cornell New York State Hometown Alumni Award from Joel Malina, vice president for university relations. Mix currently works part time as a veterinarian at the Chemung County Veterinary Clinic and runs her own large-animal practice. She also volunteers with the Kramer Foundation, fostering and rehabilitating dogs for placement with law enforcement and the military. 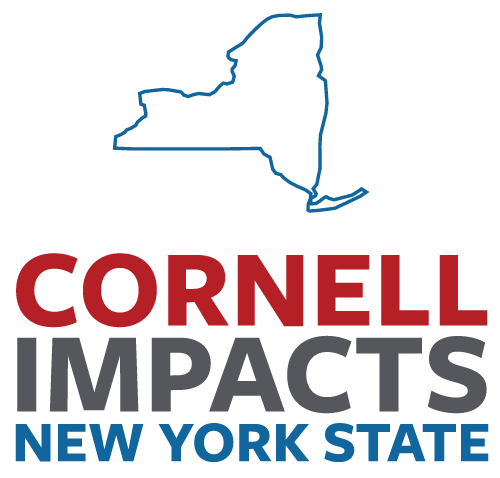 The Cornell University New York State Hometown Alumni Award recognizes Cornell graduates who return to their home counties or regions to start or enhance a business or nonprofit, and who regularly volunteer and are making an impact in those communities. Malina noted that Mix’s early enthusiasm for cattle and horses motivated her to pursue her education at Cornell’s College of Veterinary Medicine, spending as much time as she could in the large-animal clinic despite the fact that, at the time, few women were pursuing careers in large-animal care. Dr. Barbara Mix checks the ear of a search dog that is used for local search operations through the Kramer Foundation. Mix began her career as a veterinarian in Canandaigua, New York, where she also worked as a 4-H leader, became a mom to daughter Mary Jo and mentored students in a BOCES animal science program. In 2002 she moved back to her home county, where she has continued her practice, does relief small-animal work, runs her own 40-acre farm and devotes free time to volunteering. In addition to her work with the Kramer Foundation, Mix volunteers at the Greater Southern Tier BOCES, where she serves on the animal science advisory board. She provides students with internship opportunities, provides veterinary care for the resident animals, and has developed the animal science program curriculum and wrote the syllabus for the program on careers in veterinary medicine and animal care. For many years Mix also was on call for the New York State Police, responding to accident scenes that involved overturned trucks and carriers, and animals that were often loose or injured. At the ceremony, Guy Cutler, medical director at the Chemung Valley Veterinary Clinic, called Mix “one of the most compassionate and most dedicated people that I know,” noting her special interest in rehabilitating animals recovering from injuries and surgery, therefore working closely both with the animals and their human owners and companions. Laura Button, a friend, described the years of care Mix gave to a gentle, dependable retired racehorse named Jack, who was a close companion of Button’s son, Alan, who has special needs. Jack had torn the tendons in his front legs, and Mix and Button cared for him through rehabilitation and setbacks, including when Jack dislocated the bones in one leg. “At this point, she was treating all of us,” Button said. Mix understood that Jack was not a pet or a hobby or an investment – Jack “was a soulmate,” Button said. Ultimately, Mix gave Jack five additional years with Alan and his family. Representatives from the offices of U.S. Rep. Tom Reed (R-23rd Dist.) and State Sen. Tom O’Mara (R-58th Dist.) also congratulated Mix and read proclamations from the elected officials. Elizabeth Ingersoll, of the Vindonoh Horse Shelter, greets Dr. Barbara Mix at the ceremony. Mix said the award recognizes her many small roles in the community, from helping maintain the health of local dairy cattle, horses and companion animals like dogs and cats to educating high school students and helping people get their New York state veterinary technician licenses. She noted that the work she does is hard, and the results are not always positive. As part of the award, Cornell is donating $500 in Mix’s name to the Kramer Foundation and $500 to the Vindonoh Horse Shelter, which aids abandoned horses.